Are you ready for more music from the Badmon? (AllHipHop News) It's been over a year since Joey Bada$$ dropped his All-Amerikkkan Badass album. The Pro Era frontman let his followers know he is currently arranging tunes into more than one collection. 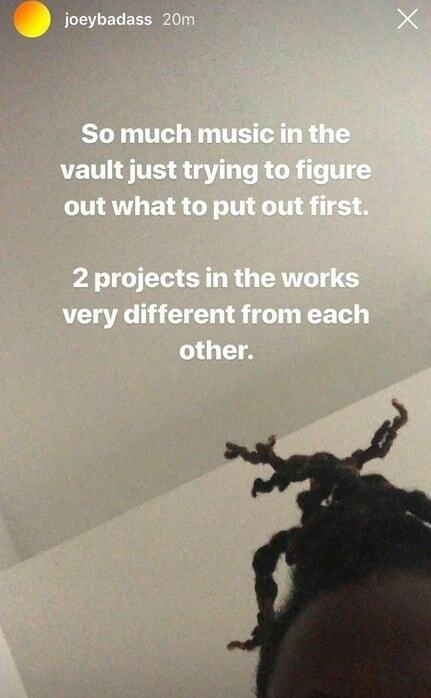 “So much music in the vault just trying to figure out what to put out first. 2 projects in the works very different from each other,” posted Joey. All-Amerikkkan Badass received positive reviews and debuted at #5 on the Billboard 200 chart. The LP included the platinum-certified single "Devastated." While the Brooklyn spitter has been laying low on the music front, he took on an acting role in the USA drama series Mr. Robot. Bada$$ also serves as the host of Tidal's 47 Minutes podcast.